My wife and I love sitting on the beach looking at the shells. This collection is an attempt to reproduce some of the beauty we find in our happy place. 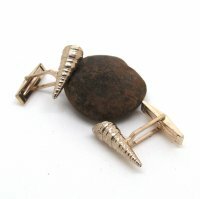 These cufflinks are cast from the a section of a shell, showing all of the internal details and patterns. They are stamped sterling. These cufflinks are cast from a whole shell, showing all of the details and patterns. They are stamped sterling. This pendant is cast from a shell I found on the beach, and has all of the details of the real thing.